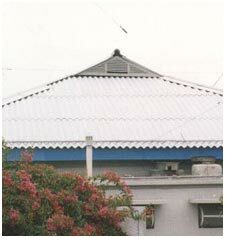 Dadex Corrugated Sheets are used for roofing and wall cladding. They facilitate design flexibility, reduce construction time and increase the efficiency and quality of installation work, thereby resulting in lower project costs. The installation is especially simplified as Corrugated Sheets do not require wet work and curing during construction. Dadex Corrugated Sheets are ideal for roofing and wall cladding for all types of domestic and low cost housing; port structures; industrial, agricultural and commercial buildings; farms, sheds, go downs, warehouses and factories. Length: 4’ (1.22m), 5’ (1.52m), 6’ (1.83m), 7’ (2.13m) and 8’ (2.44m). Can also be manufactured in 10’ (3.05m) in 7mm thickness.